The Odon Wagner Gallery is seeking to purchase works by Ivan Fedorovich Choultsé and other Russian artists including A. Harlamoff, Ivan Shishkin and Ilya E. Repin, K. Korovine, I. Aivazovsky, D. Burliuk. For over twenty-five years the Odon Wagner Gallery has successfully dealt in the works of Ivan F. Choultsé, building collections worldwide. Having sold nearly fifty works through the gallery is no small feat, considering there have been no more than 161 on offer at international auction since 1970. From very early on Odon Wagner was able to recognize the lasting value and exceptional quality of this artist's work. Choultsé was a landscape painter, born in Petrograd, Russia in 1877 and died in 1932. He studied painting with Constantin Krighitsky and became the court painter to Czar Nicholas II. After the Russian Revolution, he immigrated to Paris and in 1923 began exhibiting at the Salon des Artistes Français. Although Choultsé continued to paint Russian scenes whilst in Paris, he also undertook several trips to Switzerland's Engadine. He was fascinated with the mountainous landscape of the area surrounding St. Moritz, especially in the winter. 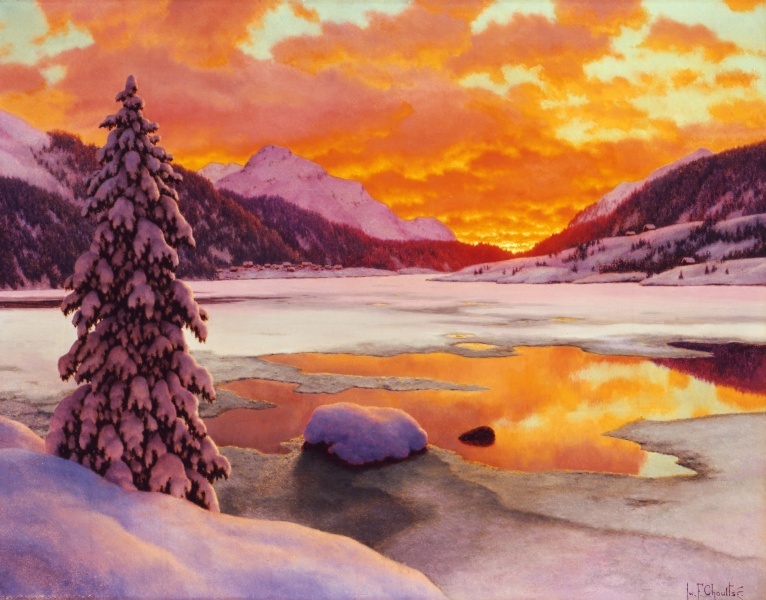 "He painted spectacular snow scenes in which the light seems to come from behind the canvas and glow. The critics scorned these pictures as photographic and called them non-art – but today this style of painting is called "magic-realism" and is much admired by critics and museum people. When I was at university I saw a small exhibition of his work at Eaton's and marveled at the technical competence of the artist, but my professor of aesthetics warned me the pictures were bogus and would be forgotten in a few years. Today they are more expensive than ever." In painting, magical realism is a term often used interchangeably with post-expressionism. In 1925, art critic Franz Roh used this term to describe painting which signaled a return to realism after expressionism's extravagances which sought to redesign objects to reveal the spirits inherent in them. Magical realism, according to Roh, instead faithfully portrays the exterior of an object, and in doing so the spirit, or magic, reveals itself. Other important aspects of magic realist painting include a return to everyday subjects as opposed to fantastical ones and a use of miniature details even in expansive paintings, such as large landscapes. Both Choultsé's subject matter and detailed rendering speak to these facets of magic-realism. His emotive landscapes, void of human inhabitants, yet profound in their serenity, are seeking to explore the majesty found in nature without adding any superfluous elements. The use of detail, in capturing light on trees and snowy surfaces, only heightens this effect.